2018 was an exciting and accomplished year for the Bachmann Team. Following its August 2017 sale and relaunch of its original brand name, which has proven a tremendous success, Bachmann has been full steam ahead. 2018 saw an abundance of orders from new and existing customers alike. Beginning almost 40 years ago, Lothar Bachmann instilled a culture of Passion and Pride with a Can Do attitude, while remaining Open & Honest and always retaining a strong Sense of Family. With these cemented core values and a long-standing history in the industry, the Bachmann name has long been synonymous with customized high quality and superior personalized service. Although there were several new equipment orders requiring precise technical skill and expertise to meet challenging operational demands, all of the completed orders in 2018 were a reflection of exactly why the industry puts immense trust in Bachmann solutions. There were far too many successes to highlight them all, but below are three, fully completed and delivered projects, representing some of Bachmann’s greatest accomplishments of the year. A North American charcoal company, exploring ways to gain economic and environmental efficiencies, hired Bachmann to design and supply a stack cap for heat retention during the plant’s shut-down and restart cycles. The expectation was that by closing the cap during furnace shut down, heat would not be entirely lost up the stack, thereby allowing for a quicker start-up, utilizing less fuel. With a fall delivery, the plant is in its early stages of analysis but the prognosis looks very promising. In fact, there are current efforts to explore possible modulation and flow-control enhancements to further increase efficiencies during operation. When a mid-western power production facility faced ongoing problems with louver dampers supplied by a Bachmann competitor, they turned to Bachmann for help. Back in 2016, Bachmann serviced the louvers, which were chronically jammed up in the ash accumulation, causing both damage to the louvers and preventing full isolation in the closed position. At the time, Bachmann urged the customer to consider a Guillotine design more suitable to their particular operational environment. 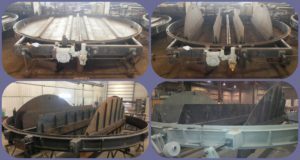 Pleased with Bachmann’s approach during the service, the customer headed Bachmann’s recommendation and, in 2018, purchased 12 Isolation Guillotine dampers as a replacement solution, which guaranteed full and safe isolation as well as eliminating any ash related jamming issues. The dampers were delivered and are now fully operational. 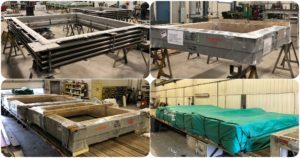 2018 was a big year for expansion joints at Bachmann Industries, particularly at refineries in the US and Canada. 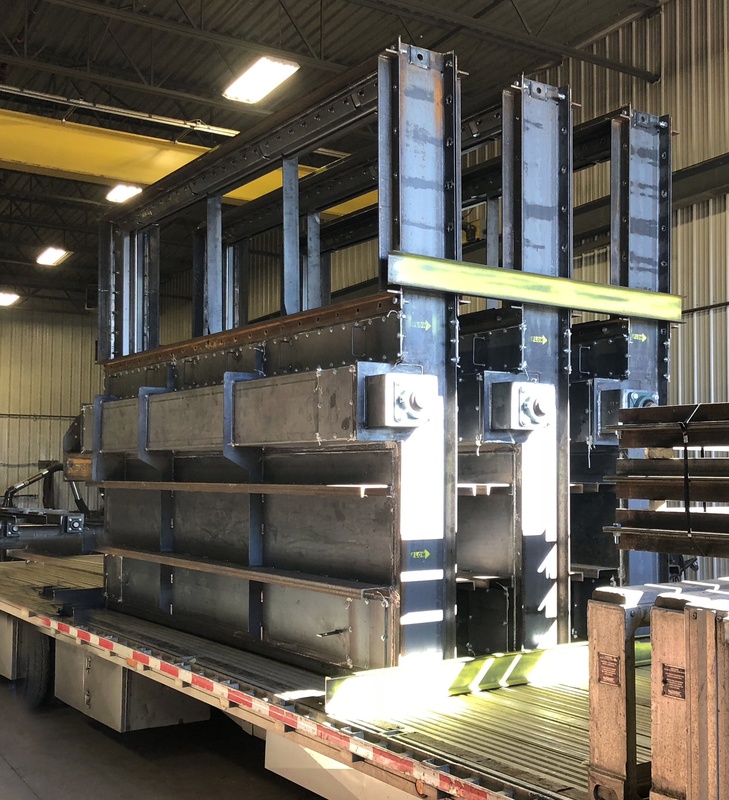 Several large orders with long delivery times are scheduled to ship in early 2019, but one of Bachmann’s earlier orders was for this refractory lined, large, 240” diameter x 29” Flue Gas cooler inlet expansion joint, designed for 3 psig @ 1950 F. Bachmann implemented design upgrades to address corrosion concerns common in cold climates with large seasonal temperature variations and facilitated shipping this 20 foot wide load to site in one piece reducing installation costs while maintaining the integrity of the part by the avoidance of field splices. This joint was completed and shipped to a refinery in Canada in July. Introducing the Newest Members of our Execution Team. 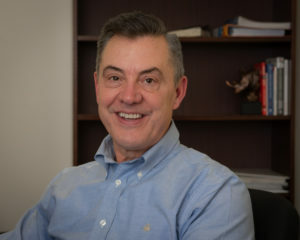 Frank grew up in Maine as one of five siblings. 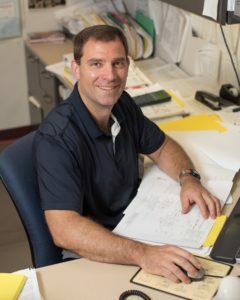 After graduating from Maine Maritime Academy with a Marine Engineering Technology degree, he went on to work as an applications engineer and eventually operations manager for a local control valve and instrumentation company before joining Bachmann in April. Frank reports he is enjoying the diverse problem solving and is most impressed by the close knit and supportive culture within the Company. 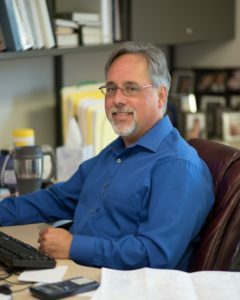 During his spare time, Frank considers himself quite the outdoorsman and enjoys fishing, boating, hiking and tinkering around with boats and cars. 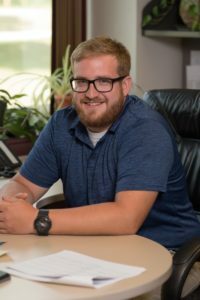 Jake also grew up in Maine but ventured outside the state, attending Penn State University where he graduated with a BS in Petroleum & Natural Gas Engineering. 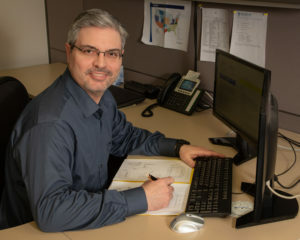 From there, his early career took him into Russia where he served as a project engineer on a newly built oil rig and then further around the globe into Europe and Asia performing API inspections and mechanical integrity assessments of fuel pipelines and tanks. 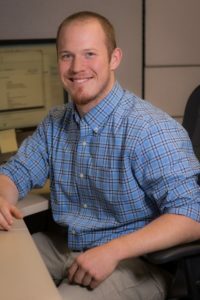 After deciding to settle back home in Maine, Jake joined Bachmann in May, where he has enjoyed the dynamic team and the opportunity to delve right into the project management aspect of the job. Like Frank, he enjoys the outdoors; camping, skiing, and hiking whenever possible. 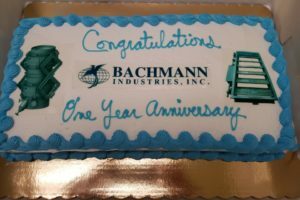 Happy Birthday Bachmann Industries !! 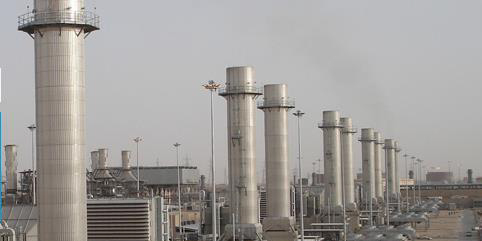 For the past 46 years, Bachmann Industries Inc has delivered high quality custom process and gas control solutions for the power and industrial sectors around the globe. However, while operating under former ownership from 2009 – 2017, the company was renamed and the Bachmann trademark itself was essentially disregarded. That all changed in August, 2017 with the sale of their ‘air gas handling’ division to a group of private investors who recognized the history, market value, and reputation of the Bachmann name. Keeping its entire work force and supply chain intact, on August 7th 2017, Bachmann Industries Inc was rebranded to all its former glory. This past year has been phenomenally successful for many reasons and our talented, energetic team and world-wide supply chain has been exceptionally responsive to the increasing market demands for Bachmann branded products. 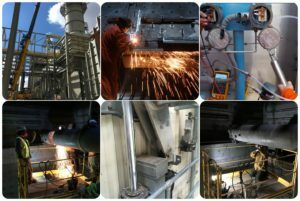 As always, Bachmann Industries continues to service and offer custom designed solutions for utility and industrial dampers, metallic and fabric expansion joints, as well as for exhaust and bypass systems. Happy Birthday Bachmann !! Bachmann Industries, Inc. was recently awarded two contracts from its South Korean customer for the Track 4A and Melaka projects located in Malaysia. 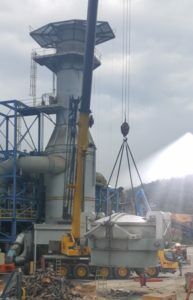 The order is for the design and supply of five (5) HRSG Stack Dampers. This is a significant order for Bachmann Industries. 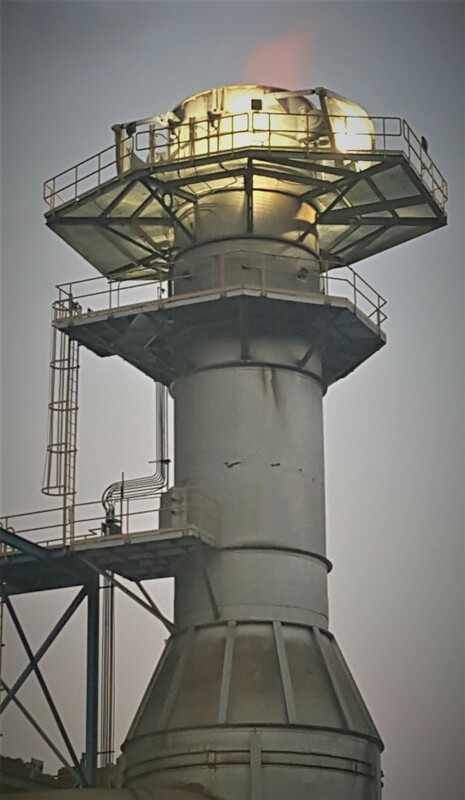 With all five units requiring a gas path diameter of Ø9 meters, these will be the largest HRSG Stack Dampers Bachmann has supplied in its history. 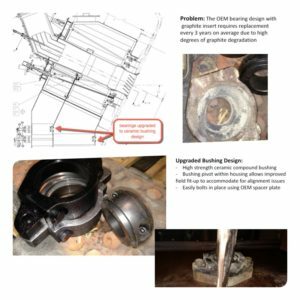 Our full line of high temperature and high pressure round and rectangular expansion joints as well as our wide variety of fabric expansion joint options can be found in our expansion joint brochure. Please contact us for your specific expansion joint needs. Bachmann’s parts and service team is focused on extending operational life of GT Exhaust systems worldwide. 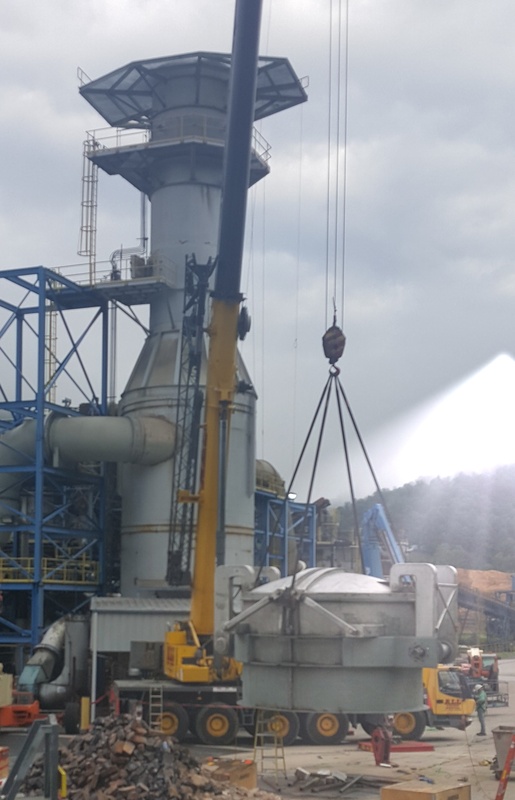 The Bachmann aftermarket team recently completed supply and supervision of full drive system overhauls and replacement expansion joints on bypass systems behind GE 7FA turbines at two different North American sites.